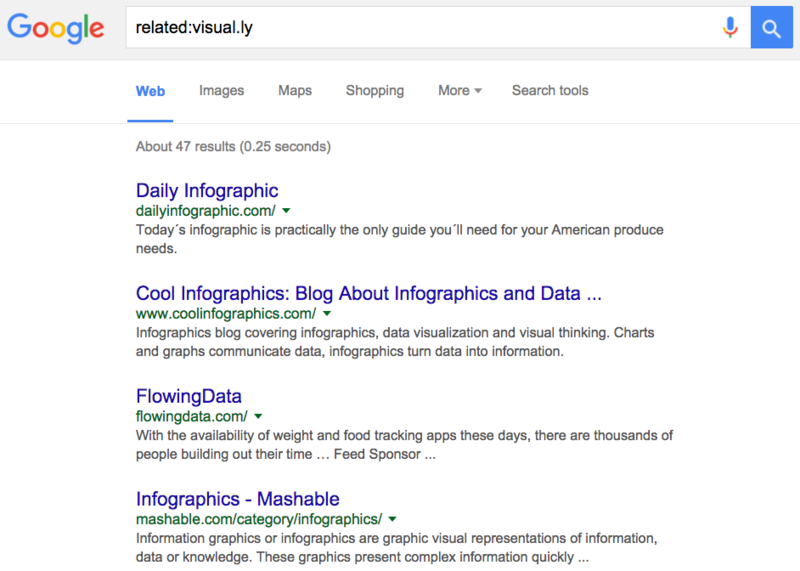 Think You Know How to Search with Google? Think Again! Written by Dharmesh Shah, HubSpot. The original version of this article appeared on the HubSpot blog. EO is proud to partner with HubSpot, which helps businesses fuel growth and build better relationships with their clients. HubSpot is one of the many partners that offers EO members exclusive discounts. EO members can get their Partner benefits and information at www.eopartners.org. If you’re like me, you probably use Google many times a day. But chances are, unless you’re a technology geek, you probably still use Google in its simplest form. If your current use of Google is limited to typing in a few words and changing your query until you find what you’re looking for, I’m here to tell you that there’s a better way—and it’s not hard to learn. On the other hand, even if you are a technology geek and can use Google like the best of them already, I still suggest you bookmark this article of Google advanced search tips. Then, you’ll then have the tips on hand when you’re ready to pull your hair out in frustration watching a neophyte repeatedly type in basic queries in a desperate attempt to find something. The following Google advanced search tips are based on my own experience and things that I actually find useful. I’ve kept the descriptions of the search tips intentionally terse, as you’re likely to grasp most of these simply by looking at the example from Google anyway. 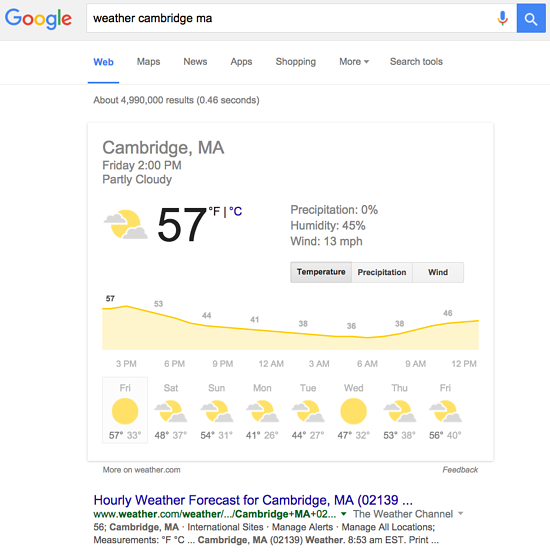 Here’s an overview of some of the most useful Google search tricks. You’ll be an expert Google search-er in no time. Let’s say you’re searching on Google for content about inbound marketing. Instead of just typing inbound marketing into the Google search box, you will likely be better off searching explicitly for the phrase. To do this, simply enclose the search phrase within double quotes. Let’s say you want to search for content about inbound marketing, but you want to exclude any results that contain the term advertising. To do this, simply use the – sign in front of the word you want to exclude. 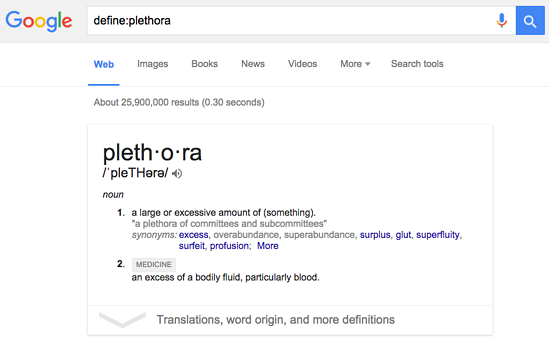 By default, when you conduct a search, Google will include all the terms specified in the search. If you’re looking for any one of one or more terms to match, then you can use the OR operator. (Note: The OR has to be capitalized). If you want to find a webpage where all the terms you’re searching for appear in the text of that page (but not necessarily beside each other), type in allintext:followed immediately by words or phrases. 5. Words in the Text + Title, URL etc. If you want to find a webpage where one term appears in the text of that page and another term appears elsewhere on the page, like the title or URL, then type in that first term followed by intext: followed immediately by the other term. Want to find a webpage with certain words contained in the title (but not necessarily beside each other)? Type in allintitle: followed immediately by words or phrases. 7. Words in the Title + Text, URL, etc. Want to find a webpage where one term appears in the title of that page and another term appears elsewhere on the page, like in the text or the URL? Type in that first term followed by intitle: immediately followed by the other term. If you want to find pages with your search query mentioned in the URL, type allinurl: immediately followed by your search query. If you want to find new websites with similar content to a website you already know of, use the related:somesite.com modifier. Let’s say you want to search for every website that cites a BuzzFeed article on their website. To do this, use the link: command, immediately followed by the name of a page. Google will give you all pages that link to BuzzFeed’s official website. The more specific the URL is, the fewer, more pointed results you’ll get. Let’s say you want to include a word in your search, but also want to include results that contain similar words or synonyms. To do this, use the ~ in front of the word. If you need to quickly look up the definition of a word or phrase, simply use the define: command. You can listen to the word’s pronunciation by pressing the megaphone icon. Ever forgotten a word or two from a specific phrase, song lyric, movie quote, or something else? You can use an asterisk* as a wildcard, which can help you find the missing word in a phrase. If you’re looking for news related to a specific location, you can use the location: command to search Google News for stories coming from that location. If you’re looking to find results that are of a specific type, you can use the modifier filetype:. For example, you might want to find only PowerPoint presentations related to inbound marketing. Want to translate a simple word or phrase from one language to another? No need to go to a translation website. Just search translate [word] to [language]. Let’s say someone calls you on your mobile number, and you don’t know who it is. If all you have is a phone number, you can look it up on Google using the phonebook feature. If all you need to do is to look up the area code for a phone number, just enter the three-digit area code and Google will tell you where it’s from. This is a rarely used but highly useful tip. Let’s say you want to find results that contain any of a range of numbers. You can do this by using the X..Y modifier (in case this is hard to read, what’s between the X and Y are two periods). This type of search is useful for years (as shown below), prices, or anywhere where you want to provide a series of numbers. Just enter a valid ticker symbol as your search term, and Google will give you the current financials and a quick thumbnail chart for the stock. The next time you need to do a quick calculation, instead of bringing up the Calculator applet, you can just type your expression into Google. Along with a normal calculator, Google has a built-in tip calculator. 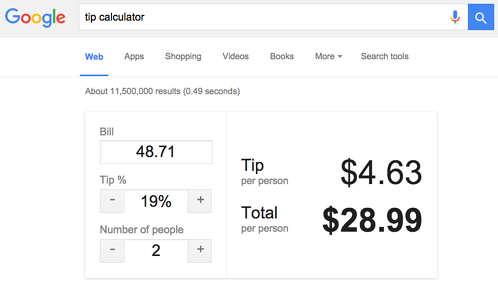 Just search tip calculator and you can adjust the bill, tip %, and number of people splitting it. Search “stopwatch” and it’ll bring up a stopwatch for you to start when you’re ready. Next time you’re looking for quick weather stats or a forecast for a certain area, search for weather followed by a location. Google will give you both before the first search results. If you’re curious when the sun will rise and set that day at a specific location, do a simple Google search with the word sunrise or sunset along with the location name. 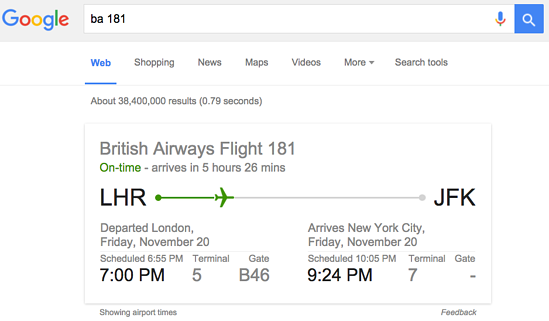 If you type in the airline and airplane number into Google, it will tell you the flight information, status, and other helpful information. Want to know the latest sports scores and future schedules of your favorite teams or match-ups? Search a single team name or two team names and Google will use Google Sports to spit out scores and schedules before the first search results. Believe it or not, if you’re ever curious how two types of (fairly generic) foods compare with one another, you can do a quick Google search to see how they differ in calories, fat, protein, cholesterol, sodium, potassium, and other nutrients.